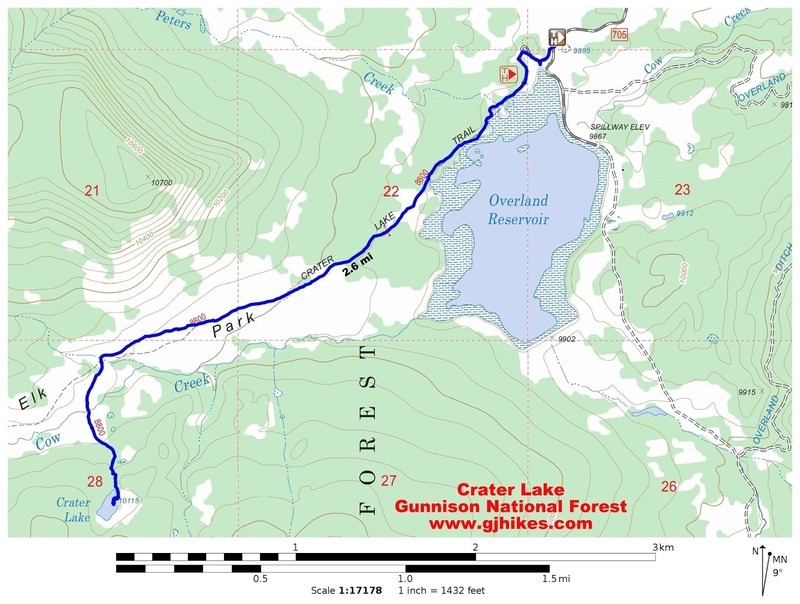 The Crater Lake trail is located in the Gunnison National Forest, near Overland Reservoir, east of the Grand Mesa. The drive getting to the trailhead at Overland Reservoir can be as enjoyable as the hike. For the grand tour I drove from Grand Junction to Collbran, stayed on Highway 330 until I reached Forest Road 265 (aka Buzzard Divide Road) where I turned right and followed 265 over Buzzard Divide for about 18 miles to Forest Road 701 (aka Stevens Gulch Road) and followed that for another 2 miles to Forest Road 705 which I followed for the remaining 5 miles to Overland Reservoir. All of the roads are easily passable with a 2-wheel drive passenger car when they are dry or mostly dry. On the trip home I followed the Stevens Gulch Road for 22 miles to Paonia. Another great choice would have been to drive the 7 miles back to the Buzzard Divide Road and continue on it for about 15 miles to Highway 133. It is not uncommon to see dozens of deer and even elk, moose and bear along this route. There are primitive camping sites and a vault toilet available at the north end of Overland Reservoir. The Crater Lake trailhead is in the trees just off the northwest corner of Overland Reservoir. I chose to park by the kiosk near the spillway so I could leave more room for the people that were camping in the area. Overland Reservoir was built by the Overland Ditch and Reservoir Company in 1905 to supply water for the agriculture needs of the Redlands Mesa area near Hotchkiss, Colorado. 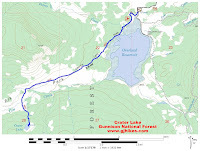 The trail begins by following the west shoreline of the reservoir for almost a mile. There were deer in some of the clearings that were staying close to the shelter of the trees. After about a mile the trail angles off more to the west and begins leaving the reservoir behind. The trail enters an open area known as Elk Park and begins paralleling Cow Creek. The vegetation totally obscured the trail in most places but it followed the same natural route that a person would probably pick if they were making the trail for themselves. There had been a pretty good thunderstorm the day before, coupled with the wetter than normal summer, making many places along the trail a little soggy. There is another trail sign after about 2 miles at the junction of the Crater Lake and Elk Park trails. I could see the Elk Park trail marked on my GPS but there didn't appear to be any indication that it had been traveled in a long time. If I were to follow that route on some future hike I would have to rely almost entirely on my GPS to find the way. From the junction at the last sign the trail begins heading more to the south and after a short distance it crosses Cow Creek. There was no getting across this creek without getting my feet wet so I waded right on through. I may have been able to find a better crossing up stream but I didn't try. After crossing Cow Creek the trail continues heading toward the trees and gradually curving more and more to the left. Once back in the trees it is only a short distance to Crater Lake. Most of the shoreline of Crater Lake is covered with basalt boulders. There is an island area that is a lot of fun to explore. There are several places here where you can camp if you chose to make this a backpacking adventure. I spoke with a family that was hiking in while I was heading back that were going to Crater Lake to fish. Apparently someone they knew had come up the week before and had caught some pretty good fish. Apparently the lake is deep enough that the fish don't winter kill. There are a whole lot of deer in this area. I saw quite a few does with little fawns and quite a few bucks also that were still sporting a little velvet on their antlers. The Elk Park area is also popular with horseback riders. A little horse traffic should go a long way in keeping the trail from being completely overgrown by the lush vegetation. Crater Lake is a little ways off the beaten path but maybe that is what a lot of people like about it. The area probably gets more visitors from the Paonia and Delta area than it does from Grand Junction. The drive took me about 3 hours on the trip in and about 2.5 going home. I stopped several times to take pictures on the way in so it may have turned out to be about the same. It would be best to come in from the Paonia side if the weather is very wet. That route is well graveled whereas the Buzzard Divide Road is pretty much all dirt. If you would like to see it for yourself then all you have to do is 'Take a hike'.